It’s another work outfit. Adulthood strikes again. Your coat is amazing, vintage finds are the best! Damn you adulthood! If we could all only look this chic and put together for that demon. I love your cardigan and skirt! Great flats too! Great brooch! Surprised to see it's Madewell. And I love that coat! Love that skirt and brooch as well! You are so chic as usual! Adulthood is the worst. But at least the clothes are better. P.S. I'd love for you to join in on my "Take One, Pass it On" Outfit Remix challenge! So cute and so work-ready! I love the skirt and the loafers. Prepster! Heheh, I love it. You always pull off the preppy school look so flawlessly. That pin is the perfect touch! the collegiate look totally works for you, and that coat is so stunning. 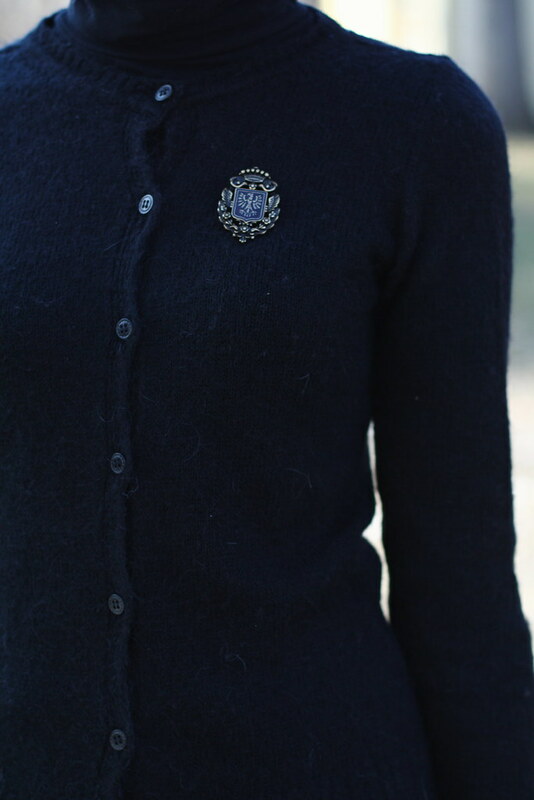 But it's a fabulous adulthood look – the brooch adds so much, I really like it! So striking! What lipstick do you use? It looks like Clinique's Black Honey. I'm really happy that I found your blog (on lookbook). I like your style – classic, elegant and feminine. I think I'll find here a lot of inspirations. I just love this coat – so unique and fabulous!